This means there is less radiant heat lost through the wall via the back of the radiator. With its attractive round contours the Vertex Swing radiator is set to charm anyone. Its specific design not only makes it look graceful, it also provides heating performance that exceeds expectations. You can also have the colour of the Vertex Swing seamlessly merge into your interior, or use it as an eye-catcher to give the space extra character. Whatever choices you make, the Vertex Swing offers you the ultimate solution. With its natural sleek contours the Vertex Tango creates allure in any interior. Whether you choose a minimalist look or a cosy warm atmosphere, its seamless angular finish makes the Vertex Tango stylish and uniform in every way. Choose one of our 35 colours to find the perfect harmony between your home and your Vertex Tango radiator. The Vertex Slim is the ultimate design radiator for anyone preferring a sleek and masterly design. The completely uniform front and flush black side panels and upper grille give the radiator an unparalleled aura. Its excellent finish adds extra class to your home, even if the space is limited. The Vertex Plan combines a sleek and decorative appearance and is perfect for applications where wall space is at a premium. This radiator can be perfectly combined with the Planar to provide a modern design and consistent look throughout your whole home. All types are provided with side panels so the radiator forms a compact unit. In both traditional and trendier new construction and renovation projects large glazed sections and terrace windows are often used to optimise natural lighting. Here Stelrad offers the ideal solution with the Vertex Style. The Vertex Style radiator is the vertical version of the Planar Style. When combining the horizontal and vertical models a light and spacious feeling is created throughout the whole home. The age of radiators being hidden behind the sofa came to a definite end with the arrival of the Planar Slim ECO. The completely smooth front and sunken black top grill and side panels give the radiator an unequaled look. You’ll want to put this radiator in the spotlight. Its high quality finish offers you a highly attractive and warm radiator for years on end. Use it in combination with the Vertex Slim to create a light and spacious feel throughout your whole home. The Planar ECO radiator is possible due to the serial water flow principle (water flows first through the front panel) perfectly suited for systems that work with low operating temperatures. The ECO technology results in high energy efficiency, maximum radiation, fast heating-up process and less energy loss through the back wall. The combination of this technology with the flat front and a full casing, lets you enjoy our green heat with style and versatility. The Planar Style ECO radiator is possible due to the serial water flow principle (water flows first through the front panel) perfectly suited for systems that work with low operating temperatures. The ECO technology results in high energy efficiency, maximum radiation, fast heating-up process and less energy loss through the back wall. Together with the symmetry of the horizontal lines of the stylish front, panel the Planar Style ECO creates a pleasantly warm environment with its stylish look and heating performance. The Planar radiator is the first in a series of decorative Stelrad radiators. With its flat front, closely fitted decorative grille and side panels offering a stylish alternative for a multitude of applications. The Planar can be connected either as a valve or compact radiator. With its sleek and timeless design, the Planar easily compliments Stelrad’s other decorative ranges. The Planar Plinth is Stelrad’s response to the growing demand for low-line designer radiators. Because large window sections are being increasingly used in modern architecture, our plinth radiators are available either with a flat front and back panel or flat front panel. Despite their modest size the Planar Plinth radiators still achieves high heat outputs. Are you having problems finding a suitable radiator for your large window sections? The Planar Style Plinth offers you the perfect solution. This plinth radiator is available with one or two stylised fronts. In combination with the Planar Style or Vertex Style, with its horizontal play of lines the Planar Style Plinth radiator ensures design consistency throughout your home. The Compact Planar radiator with its close-fitting casing gives your home a neat and contemporary finish. In addition, it is equipped with a lovely flat front panel. With the Stelrad Compact radiator as a base, the Compact Planar’s flat front radiator adds a touch of beauty to any interior. The decorative Compact Style radiator features horizontal lines creating an atmosphere of space and sophistication. A compact radiator that has a stylish front panel, with close-fitting side panels and decorative top grille giving your home a neat and distinctive appearance. 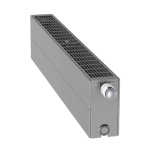 The ECO radiator and its serial flow technology are perfectly suited to operate in low-temperature heating systems. This technology (water flows first through the front panel) results in higher energy efficiency, maximum radiation, faster heating rate and less waste of energy through the back wall. In addition, the ECO Galva radiator is treated with a protective galvanized coating, so it can be used without any concerns in wet areas. Without sacrificing any heat output the vertical design of the Vertical Galva saves space. In addition, this radiator is treated with a protective galvanized coating, so it can be used without any concerns in wet areas. The Novello Plinth offers the perfect solution for spaces with large window sections from floor to ceiling, for shop windows, verandas, winter gardens or under window sills. Its subtle construction means this radiator perfectly matches any interior. The cold air close to a window is heated to provide warmth. The Novello Plinth is available as a wall model or stand-alone design. A Compact radiator with very specific dimensions to replace old cast-iron and ribbed radiators while using the existing piping system. With its side panels and decorative grid finish, this radiator also offers the same benefits as an enclosed radiator. An Accord radiator with an additional protective coating for spaces where there’s moisture. The ideal panel radiator for your bathroom. With its vertical assembly the Vertex not only saves space, it is also suitable for use in small spaces. The Vertex takes up a minimum of space and optimally heats the cold air next to large window sections in the kitchen or entrance hall. The Planar Style 8 is with a stylish front, perfectly fitting side panels and upper grille a decorative radiator that creates an atmosphere of light and space. Furthermore you have, thanks to the 4 side- and 4 bottom connections, a variety of connection possibilities. This makes the Planar Style 8 easy to install and applicable in about every situation. The Planar 8 is with a flat front, perfectly fitting side panels and upper grille a decorative radiator with a timeless design. Furthermore you have, thanks to the 4 side- and 4 bottom connections, a variety of connection possibilities. This makes the Planar 8 easy to install and applicable in about every situation. The Novello 8 stands out because it is fully dressed with side panels and a top grille. In addition, thanks to the 4 side- and 4 lateral connections, you have a wide range of connectivity options. This makes the Novello 8 extremely assembly-friendly and applicable in just about any situation. The Novello radiator is fully enclosed with side panels and a decorative grid that both fit seamlessly to the radiator. This finish really enhances the presentation of your living space. Moreover, this radiator is equipped with an adjustable, preset perfitted thermostatic valve insert that regulates the water in the radiator. This radiator therefor always achieves an optimal efficiency. With its seamless casing the Stelrad Compact All In gives your home a tidy and finished character. The safe casing has a highly aesthetic and child-friendly finish. This radiator is fully equipped and ready to install. This the mother of all radiators, making it the model for the other radiators in our range. A solid radiator with a very high heat output without a grid or side panels.